Context: Adolescent well-being is a priority area for health-care interventions in the 21st century. Yoga-nidra is an ancient Indian method of enabling individuals to attain a positive state of deep physical, mental, and emotional relaxation. The practice produces a state of simultaneous relaxation and detachment resulting in inner awareness and release of stress on all planes of one's being. Aim: This mixed method study was carried out in adolescent students aged 13–15 years with an aim to assess effects of Yoga-nidra on various dimensions of well-being. Materials and Methods: Thirty-six students received Yoga-nidra sessions 30 min daily for 3 days in a week for 1 month. Primary outcome measures were happiness, perceived stress, overall quality of life, and psychological general well-being. 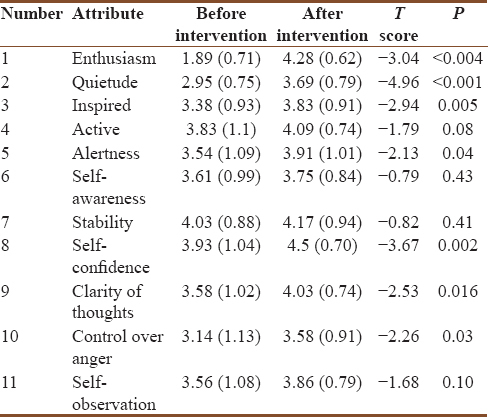 These and other experiential dimensions of well-being comprising of enthusiasm, alertness, quietude, clarity of thought, control over anger, self-confidence, and self-awareness were evaluated before and after intervention. Qualitative observations were recorded from participants, their teachers, and parents. Results of quantitative and qualitative methods were analyzed and compared. Results: Yoga-nidra intervention resulted in significant improvement in all primary outcome measures. Participants reported significant improvement in the feelings of happiness, enthusiasm, quietude, being more inspired and alert, active, having clarity of thought, control over anger, and self-confidence at the end of the study period. Mixed method design of the study provided cross-validation and convergence of results obtained from quantitative and qualitative assessment tools. Conclusion: Yoga-nidra is beneficial in improving multiple dimensions of adolescent well-being. Adolescence is the phase of life stretching between childhood and adulthood which encompasses elements of biological growth and major social role transitions, both of which have important bearing for future life of individuals and the nation. It is an important time for mental health interventions for improving present and long-term mental health. Engaging individuals in specific forms of training to cultivate well-being through psychotherapy and meditation training have been shown to enhance well-being. Yoga-nidra is a powerful relaxation practice enabling oneself to relax completely and consciously. Yoga-nidra has been shown to enhance well-being in number of studies in health-care professionals and college students, but there is dearth of studies on effects of Yoga-nidra on adolescent well-being. Introducing a school-based Yoga-nidra intervention has a potential to reach out to adolescents in a safe, attractive, and easily applicable manner which can be intertwined in formal education for the promotion of positive mental health and building life skills and resilience. We set out to document the effect of Yoga-nidra on anxiety, perceived stress, happiness, and overall general psychological well-being in adolescent students through mixed method study. The study was carried out after approval from Institutional Ethics Committee. Written informed consent was obtained from the parents of the participants and written informed assent was obtained from the participants. Thirty-six volunteering students aged 13–15 years from standards 8 and 9 were enrolled. Students had been exposed to conventional yoga (physical postures) but not to Yoga-nidra before the study and they did not participate in any other yoga practice during the study period. Preexisting acute/chronic illness or development of acute illness during the study period constituted the exclusion criteria. Yoga-nidra sessions were conducted for 30 min a day for 3 days in a week for 1 month by experienced instructors. ”Experiential effects of Yoga-nidra” (a researcher designed tool for capturing certain positive and deeper qualities of one's well-being which are not hitherto overtly covered). Attributes measured were feelings of enthusiasm, being active, alert, and inspired, experiencing quietude, experiencing a state of self-awareness, stability and self-confidence, having clarity of thoughts, control over anger, and developing a capacity of self-observation. Feedback from teachers and parents (through an open-ended semi-structured questionnaire) about their observations regarding any changes in participants' behavior. Descriptive observations were thematically analyzed with respect to positive emotions, negative emotions, and cognitive aspects of well-being. Thirty-six students were participated in the study; 12 students were from the 8th standard and 24 students from the 9th standard. There were 20 male and 16 female. There were no dropouts. Pre- and post-intervention results of Faces scale for happiness, VAS for perceived stress, and ladder scale for overall QOL showed statistically significant improvement (Faces and VAS scales had reversed scoring scale; reduction in the score was indicative of increase in happiness and decrease in stress) [Table 1]. 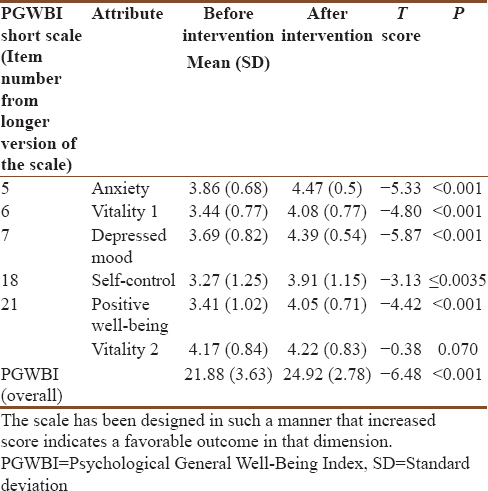 There was statistically significant difference in all items of PGWBI-short subscale measuring anxiety, vitality, depressed mood, self-control and positive well-being, and vitality, respectively. There was also significant improvement in postintervention overall positive general well-being index [Table 2]. There was statistically significant improvement in the qualities of enthusiasm, quietude, feeling inspired, alert, and having clarity of thoughts and control over anger. However, no difference was observed in feeling active, self-aware, stable, self-confident, and self-observant [Table 3]. The emotional (positive and negative) and cognitive experiences captured while going through participants' daily records were feeling happy, peaceful, more energetic, feeling less worried, more in control of one's anger, experiencing freshness, disappearance of physical fatigue, and having an enhanced ability to focus while learning. All 36 participants reported that the practice brought an experience of state of happiness, peace, and enhanced vitality during the session. A sense of happiness and relaxation was writ large on their faces at the end of every session. Twenty-seven students reported that the experience of peace continued through the day. They felt energetic and fresh through the day. One student described that he felt an atmosphere of peace spreading over the entire class. Another student mentioned that he felt peace in his mind as well as in body. Six students described that the practice removed their tiredness. “It makes the body light and mind happy” narrated a boy. Twenty-one students reported that because of the intervention, they were feeling less angry. “Practice of Yoga-nidra brings about happiness and helps in learning better” - remarked most. Twenty participants reported that they could focus better in classroom. Their learning became more enjoyable. A couple of them narrated that the practice allowed them to recall better while taking weekly examinations during study period. Six students reported that their self-confidence increased. One student described that his power of resolution increased at the end of 1-month period. Parents and class teachers of the participants observed that their wards appeared quiet and happy and lost temper less frequently during the study period. In parlance of positive psychology, term well-being denotes an intangible and unifying concept of several human dimensions, including hedonic and eudemonic dimensions. In the parlance of ancient Indian psychology, well-being refers to awareness and manifestation of a transcendental state of awareness, which human beings are capable of accessing. Yoga is the science, the process, the effort, and action by which man attempts to pass out of the limits of his ordinary mental consciousness into a greater spiritual consciousness, from the phenomenal to the real man. Yoga-nidra, a part of Pratyahara technique of Yoga, facilitates a state of inner awareness and outer detachment, which can potentiate many self-development and well-being practices. Yoga-nidra intervention significantly reduced stress, increase in happiness, and overall QOL in our study. Assessment of stress using VAS is an accepted and reliable method which avoids communication-related issues encountered in impersonal questionnaire-based studies. The Faces scale for happiness has been shown to be reliable in predictive value and reflects totality of one's state of happiness. 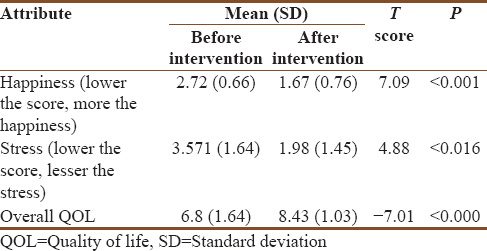 Reduction in stress and anxiety levels and definite increase in general well-being of college students and nurses as a result of Yoga-nidra intervention have been observed by Kamakhya et al. There was a significant increase in adolescents' perspectives of their overall QOL using QOL Ladder. Yoga-nidra improved psychological general well-being as measured by PGWBI-short scale, which assessed dimensions of anxiety, vitality, depressed mood, self-control, and positive well-being. This effect was observed in every component of the scale and total six-item score (Cronbach's alpha, 0.73). The results of assessment tool “Experiential effects of Yoga-nidra” which was intended to reflect deepest cognitive and behavioral phenomena which underlie the outward effects measured conventionally corroborated with other parameters. Participants felt immensely enthusiastic, alert, inspired, and quiet during the study period and experienced self-confidence and clarity of thinking. Parker et al. demonstrated that there are conceptual difference and practical distinction between Yoga-nidra and other methods of guided relaxation. Elaboration of deeper and esoteric significance of effects of Yoga-nidra provided in standard ancient scriptures is beyond the scope of this study. From of modern psychology perspectives, sustained positive emotion, recovery from negative emotion, empathy, altruism, mindfulness, and emotion-captured attention are novel constituents of well-being. The neural circuits that underlie each of these constituents overlap partially and thus can be transformed through experience and training. From the perspective of ancient descriptions of yoga, the four powers and objects of yoga are purity, liberty, beatitude, and perfection, which too can be cultivated and attained through methodical self-development, which ultimately foster attainment of highest level of well-being. The study lacked a control arm and hence limitation in delineating effect of confounding factors such as the group interaction itself. Longitudinal research on this simple and promising intervention through short, intermediate, or long term (4, 8, or 12 weeks) in larger sample size and with control arms is necessary to reinforce the conclusions. This small study shows that Yoga-nidra has positive effect on adolescent well-being as assessed multiple assessment tools. We are also grateful to Mr. Karamchand, Statistician, Central Research Services for the technical expertise provided for analysis of the data. Andrews FM, Withey SB. Social Indicators of Well-Being: Americans' Perceptions of Life Quality. New York: Plenum Press; 1976. Cantril H. The Pattern of Human Concerns. New Brunswick, NJ: Rutgers University Press; 1965. Grossi E, Groth N, Mosconi P, Cerutti R, Pace F, Compare A, et al. Development and validation of the short version of the psychological general well-being index (PGWB-S). Health Qual Life Outcomes 2006;4:88. Salagame KK. Meaning and well-being: Indian perspectives. J Constr Psychol 2017;30:63-8. Aurobindo S. The Life Divine the Complete Works of Sri Aurobindo. Pondicherry: Sri Aurobindo Ashram Publication Department; 1997. Kamakhya K. A study on the impact on stress and anxiety through Yoga Nidra. Indian J Tradit Knowl 2008;7:401-4. Parker S, Bharati SV, Fernandez M. Defining Yoga-Nidra: Traditional accounts, physiological research, and future directions. Int J Yoga Therap 2013;23:11-6. Helliwell JF, Layard R, Sachs J. World Happiness Report 2013. New York: Sustainable Development Solutions Network; 2013.